Car rides can be fun for your dog. But, for some, anxiety prevails. Panting, drooling, whining, barking are indicators that your dog is experiencing stress. In a recent 4knines blog, Jane Bowers described how to recognize the signs of stress in your dog. When I work with owners of anxious pets, I recommend owners try a couple of techniques. The first technique I know everyone can do. This technique is called breathing! We don't breathe fully most of the time. Stress makes us breath more shallowly. Our pets pick up our respiration rate better than we do. If we are anxious, it validates to our pet their fear is real. If we can breathe fully, our pet will trust us that they are safe. It sounds simple. It is! Despite the simplicity, it is still hard to remember to breathe! The fight or flight response system is triggered when anxiety occurs. This is a reactive system. There is very little thinking happening. It doesn't matter if it is in our pets or in humans, the physiology is basically the same. There can be many reasons why the anxiety began. Once a fearful experience happens, a pet can create a habit very rapidly. They can enjoy car rides, then have a negative experience and suddenly become afraid. The adrenaline and fear chemicals course through the dog's body. A Post Traumatic like situation can result if the fear is strong. Anxiety can start the second the car starts or even the words "car ride" can trigger it. Breathing helps counter the fear state. Even if we are not touching our pet, they can pick up our energy. If we are calm, they are more likely to listen to that. Breathing deeply calms us. It lowers our blood pressure and heart rate. Our pets can feel the difference. This is true in the car and do they ever pick up our emotional state on walks. That energy carries right through the leash. If you are breathing in a calm state, that is more likely to be heard by your dog. Breathing is your most useful tool in helping an anxious pet. The second technique is thinking to your pet. Temple Grandin wrote about this technique in her book, Thinking in Pictures. Our dogs can learn a little of our vocabulary. But, what they most comprehend is what we are communicating to them via our minds and emotions. I like to tell pets exactly what is going to happen. But I don't say it with my outside voice. I use my mind and think it to them. I had a wonderful dog, Rusty, who actually loved car rides! However, he was a rescue and I was his third owner. Car rides to new places triggered him. He became excessively anxious going to new places. Coming home, he was fine. 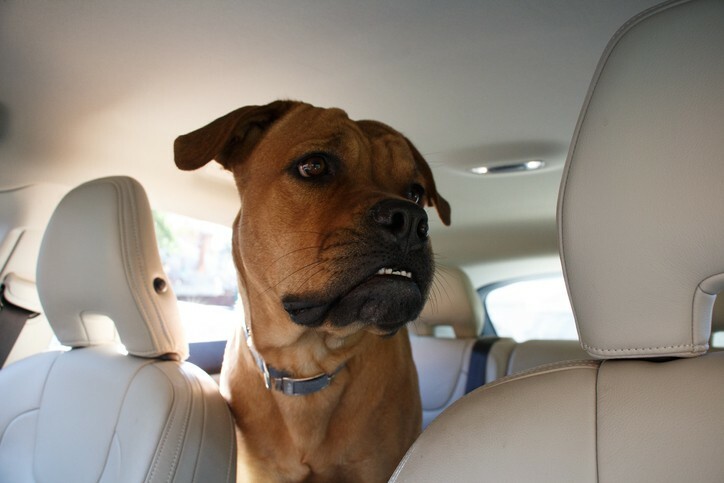 But going to new places filled the car with whines, yelp barking, panting and drooling. On one ride, I decided to think to him what we were doing and where we were going. I was amazed when he yawned and laid down after I thought to him what we were doing and where we were going. Almost every time I used that method, he calmed dramatically. When I used my outside voice, it had little effect. When I used my thoughts, I had more success. I have since used this method on many animals and many different species. I find it way more effective. There is another added benefit to using non-verbal mental communication with your pets. It can lead to an even deeper bond. There is a heart to heart connection besides the mind-to-mind connection. Those are treasured moments when you connect with an animal in that way. I encourage you to give it a try! 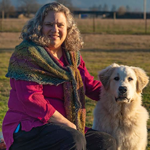 Cindy Myers is a medical intuitive who works on both animals and humans. She is an empath and can feel where emotions and energetic blockages are occurring and can help remove those blockages. She works with clients all over the country and internationally. Cindy does most of her work at a distance over the phone. She teaches webinars about animals and emotions and how to develop and use your intuition for yourself and your pets. She has authored two books. Her book 5 Steps to Animal Communication has lead to workshops. She has frequent speaking engagements around the country. She lives in Oregon on her alpaca farm. You can learn more about Cindy on her website, www.BeAnAnimallistener.com.